Plane Stupid shuts down Manchester terminal. 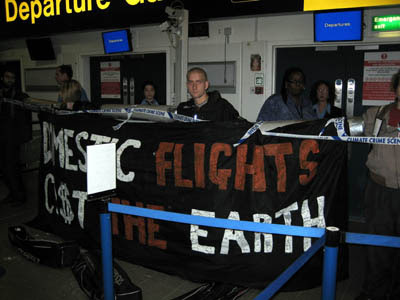 Members of the Manchester “Plane Stupid” eco-protest group shut down Terminal 3 at the Manshester Airport. 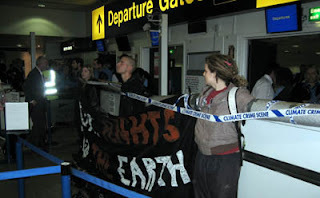 Activists from Manchester Climate Action and Manchester Plane Stupid have blockaded the security check-in of terminal 3 of Manchester Airport. 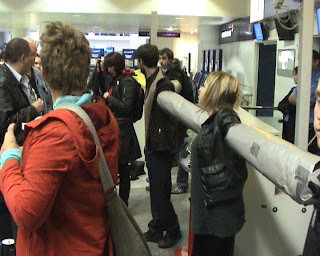 Passengers are being denied access to the departure lounge by seven activists locked together using arm-tube devices. Two banners have been unfurled reading, “Manchester City Council… supporting climate chaos” and “Domestic flights cost the Earth”. Other protesters are leafleting passengers with information about aviation and climate change as well as handing out train timetables for route destinations. Aviation is the fastest growing source of green house gases and according to the government is responsible for 13% of the UK’s global warming contribution. 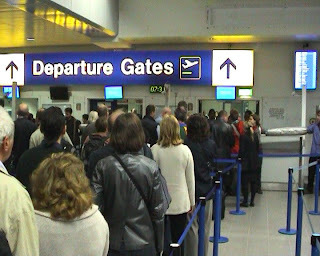 The overwhelming majority of flights from terminal 3 are to domestic UK destinations such as London Heathrow. These are the most unnecessary flights. The group are calling for an end to all domestic and short-haul flights and for international aviation to be included in the Climate Change Bill. The protesters are also highlighting the contradiction between Manchester City Council’s ‘Green City’ initiative and their 55% ownership of Manchester airport . The airport intends to expand its annual passenger numbers from 22 million in 2005, to 39 million by 2015, to 50 million by 2030. The action today was inspired by the Camp for Climate Action which saw around 2000 protesters gather next to Heathrow airport in London this summer.